USS Lyndon B. Johnson (DDG 1002) was launched at General Dynamics-Bath Iron Works, Dec. 9, 2018. 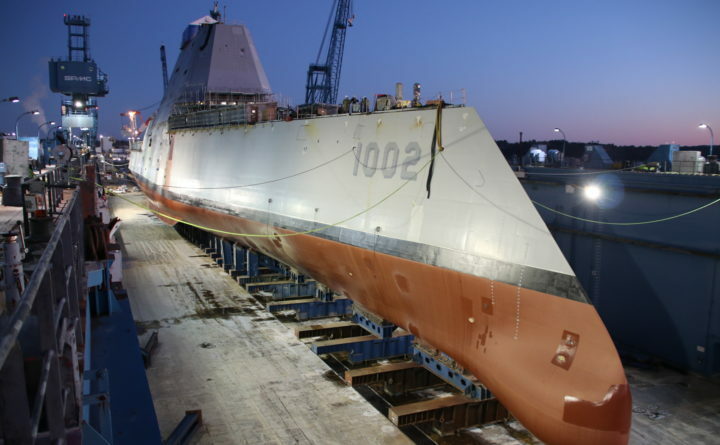 BATH, Maine — The U.S. Navy has awarded Bath Iron Works a $26.4 million contract to provide planning yard services for the DDG 1000 “stealth” guided missile destroyer. If all options are exercised and the contract is fully funded, the total value of the contract could reach $86.7 million and extend the period of the contract through 2023, according to a news release from the Navy. Planning yard services include engineering and support, design, maintenance and modernization planning, repair and/or overhaul availability planning and scheduling, material kitting, logistics, planning and execution. Most of the work (92 percent) will be completed in Bath, according to the release. The shipyard already manages post-delivery maintenance and modernization activities for the Arleigh Burke-class (DDG 51) and LCS-class ships. The contract was awarded following a limited competition, according to the Navy.